The latest 24-inch Cinema Displays now look like the the iMacs (and by extension, the latest MacBook and MacBook Pros) with a glossy black front and a silver back. The glass display looks great, but the cool innovation is the three-prong connector that we talked about during the liveblog. One goes to the MagSafe, one goes to USB and one goes to the Mini Display Port. 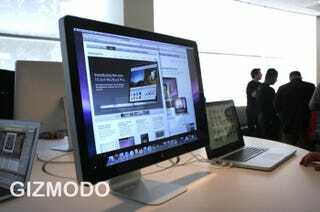 $899 is a bit more than other comparable 24-inch displays, but nothing else comes bundled with that MagSafe. Aesthetically, it's the only one that matches with the design features of your MB or MBP, so if that's important to you, you've got a new monitor.